Head to Newport Performing Arts Theater on June 1, 2013 and catch "Some Enchanted Music: Broadway Hits in Concert". A gathering of the finest Filipino dance talents here and abroad led by prima ballerina Lisa Macuja-Elizalde ? will go on stage on June 1, Saturday, 7:30 p.m. at the Aliw Theater, CCP Complex, Pasay City. Presented by Ballet Manila, the Manila Broadcasting Company and Aliw Theater, the one-night gala concert brings together onstage for the first time today's most exciting and multi-awarded Filipino dancers, many of whom are coming home from the ballet companies they represent abroad. The show is a benefit for Ballet Manila’s scholarship program, Project Ballet Futures. One way to moderate an artist is through his power as a storyteller. After all, all artists work with their own experience, constructing a visualized dream. The audience, therefore, is compelled to journey through the world the artist creates - in effect a character in the artist’s story. It doesn’t really matter if there is no logical outcome, or that the necessities of a plot structure are seemingly abandoned. Dreams, after all, never follow the elements of a plot, yet somehow people can still recall and narrate what happens. And this does not dilute the emotional impact of the experience. "Sounds of Freedom" is meant to be an independence day celebration that gathers creative energies of the young and young at heart. The 2013 edition of Sounds of Freedom celebrates Animaguitara’s tenth year in the music industry and a decade of commitment to provide solid music enrichment programs for people from all walks of life. This is an independent endeavor run by conservatory-bred Jonathan Gonzales with the support of allied musicians, fellow independent artists, and an arts and culture programming arm. CIFRA wrote the hits “Puwede Bang Ako Na Lang Ulit?” by Bugoy Drilon and “Prinsesa” by VFort Band. CIFRA SINGS The CLASSICS also features Viva Artist Paolo De Los Santos, Comedian Aya, and Legendary Live Comedy Director Mr. Andrew De Real. This is a Benefit Show for Biliary Atresia Awareness. For Tickets and Seats Reservations, please call The Library at (63 2) 522-2484, (63 917) 529-6653, (63 928) 843-6888 or (63 916) 439-7898. Experience a different high as one of the greatest comic gems in opera, L’Elisir d’Amore (The Elixir of Love) featuring Russian operatic soprano Anna Netrebko, in high definition video and full dolby sound at the Cultural Center of the Philippines’ Tangahalang Aurelio Tolentino (Little Theater) on May 28, 2013 at 2pm and 7pm. L’Elisir d’Amore is the third of five encore performances of the latest season of The Met presented by the CCP and the Metropolitan Opera (The Met) in cooperation with the Opera Guild Foundation of the Philippines. It is only after the awakening that one realizes that the state of sleep is over - a travel, serendipitous or planned, from dreamscape to the reality. Six artists come together to depict through their art what it feels like to travel across - or sometimes, stay in between - the faint borders of night and day, past and present, mistakes and realizations, observations and recognitions, provocation and action, and stasis and motion. Camoco Bafllaga’s one-act play “What Puring Wants, Coring Needs,” brings the cutthroat competition among television stations onto theater through the two hilarious exchange between its two major characters, Puring and Coring. Audiences will be able to identify with Puring and Coring as they outwit and out-charm each other in order to win the Best Audience of the Year Award. In the end, both Puring and Coring reveal that they are smarter that the networks dictate they should be. In an effort to expand the base of filmmaking practitioners, IFC (Philippine Independent Filmmakers Cooperative) is organizing a film camp for hobbyists and beginning filmmakers to jumpstart their movies this summer - 2013 IFC Creative Filmaking Camp: From Concept to Screen. The Korean Cultural Center in the Philippines will be featuring the contemporary artworks of noted Filipino and Korean artists in its upcoming exhibit entitled “Summer: A Midsummer Night’s Reunion” which is set to be launched on May 17. The arts exchange exhibit by the Center is now on its second year, following the maiden launch last year with spring as the theme to signify new meetings. In Korea, spring stands for new meetings and friendships. In celebration of its 11th year anniversary, the Silly People’s Improv Theater (SPIT) and the PETA Theater Center proudly present the Manila Improv Festival 2013 from June 25-30, 2103. The theme for this year is “Follow Your Feet”, an improvisational theater concept which also ties in with the art form’s return to PETA - the group which first introduced improvisational theater to the country in the early 1970s. As SPIT takes on a new decade of laughter and innovation, the group decided to take a bolder step in sharing the art of improv to bigger audiences through the festival and its partnership with PETA Theater Center. Rico Blanco, one of the hottest and most sought after OPM artists today, is set to hold his first ever solo concert ! 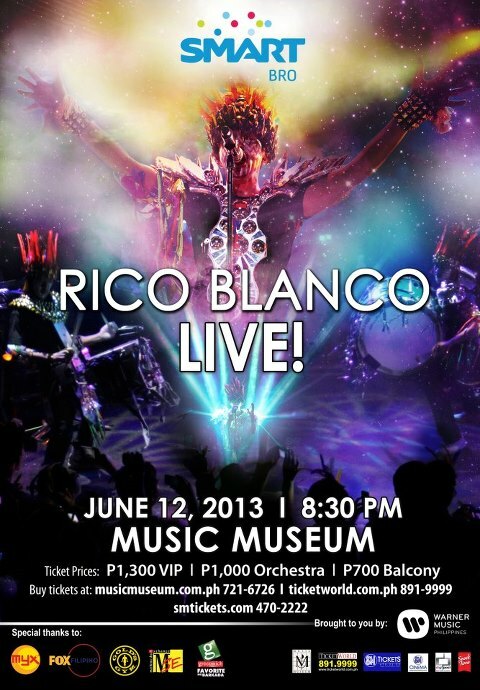 Catch him live at the Music Museum on Philippine Independence Day, June 12, 2013, and be a part of music history. It’s been five years since this former Rivermaya frontman struck out on his own, and two solo albums later (Your Universe and last year’s Galactik Fiestamatik), he’s hotter than ever and ready to rock the stage in his first full-length solo concert! 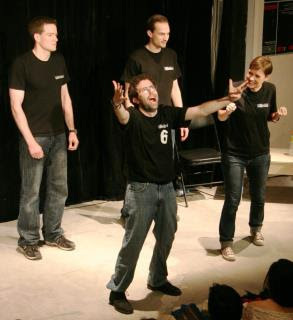 The Silly People’s Improv Theater (SPIT) is now 11 years old !!!!! Being the country’s premiere improvisational theater group known for their smart and incisive brand of comedy, SPIT has represented the Philippines in numerous international events such as the prestigious Los Angeles Comedy Festival in 2004, and more recently, in the Hong Kong and Beijing Improv Festivals. It’s sing-a-long night this Saturday, May 11, 2013, starting at 6:00 p.m., in Labs Kita, Sabado, with featured guests - singer Denise Rapadas and singer/guitarist Bei Bermas. Venue is the Rizal Park Central, Manila. Admission is free. Catch the exciting improv theater groups who will participate at the Manila Improv Festival 2013 from June 25-30, 2103. The Manila Improv Festival 2013 will have six shows featuring the participating improv groups: People's Liberation Improv and 3 Dudes Improv (Hongkong), Beijing Improv (Beijing), Taichung Improv (Taiwan), Xiamen Improv (Xiamen), Zmack (Shanghai), Pirates of Tokyo Bay (Tokyo) and Silly People’s Improv Theater (Manila). Ang Kinang ni Kahlim, with book and libretto by Jose Jeffrey Camañag and original music by Jesse Lucas, serves as the culminating production of Batch 2013, graduates of the annual Gantimpala Theater summer workshop for teens and young adults. Performance is on May 11, 2013, Saturday, 4:00pm.at the Santa Isabel College Auditorium, Taft Aveue, Manila. The musical tells the story of Tatay God who just finished creating a colorless world. He assigns Archangel Michael (Alvin Duckert) and assistant Miguelito (Aljonas Ponio) to gather the Anghel ng mga Kulay so that they bring color to Tatay’s wonderful creation putting an end to all the dull and drab. CIRCUIT FEST is custom built for the music concert fan who wants to celebrate summer like there is no tomorrow. Enter yourself into a playground of awesome music, thrilling skateboard tricks, games, crazy mosh pits & hot summer fun. It’s time we celebrate our freedom to rock in this all-day music & skateboard festival. In its continuing bid to promote international relations through dance, Ballet Manila engages in another artistic collaboration, this time with South Korea's Choi So Bin Ballet. The two groups are featured in the upcoming production Carmen: An International Friendship Gala, showcasing a repertoire of classical and contemporary numbers. Presented by the Manila Broadcasting Company, Ballet Manila and Star Theater, it will go on stage on May 4, Saturday, 7:30 p.m., at Star Theater, CCP Complex, Pasay City. The phenomenal comedian in the Philippines, Vice Ganda will be having a mega concert this coming May 17, 2013 at the historic Smart-Aranet Coliseum. The upcoming concert will be directed by Bobet Vidanes. With guests, Ai Ai Delas Alas, Regne Velasquez, Enrique Gil, Paolo Avelino, Daniel Padilla and Ms. Dawn Zulueta. For ticket inquieries, please call Ticketnet at (63 2) 911-5555. Acclaimed actor for stage, television and film Nonie Buencamino kicks off the Cultural Center of the Philippines’ musical concert series Triple Threats: Leading Men and Women of Philippine Musical Theater on June 13, 7:30 p.m. at the CCP Tanghalang Aurelio Tolentino. As part of the MCO Foundation 28th Season, two internationally acclaimed artists - pianist Albert Tiu and clarinetist Marcel Luxen - will open MCO Foundation's Great Performances Series this coming June 1, 2013 at 7:00 p.m. at the Ayala Museum, Makati City. Philippine folk art plays an important role in the development of the country’s visual art scene. With motifs and compositions that are more attuned to indigenous sensibilities, folk art has spurned the creation of a unique Philippine identity that strongly resonated among the pioneers of Philippine art, especially within a post-colonial framework seeking to unearth core Philippine values. MMI and Ovation Productions are proud to announce a special performance by multi-Grammy award winning artist, Jason Mraz on Tuesday, May 14th at the Araneta Coliseum. Jason has taken his musical journey from coffee houses to stadiums globally and now has two Grammy Awards and six Grammy nominations to his credit. Ang Teatro Baguntao ay isang kapatirang pangteatro mula sa Mataas na Paaralang Ateneo de Manila, na binubuo ng mga binatilyong naglalayong makapagtaguyod ng Filipino at makapagdulot ng panlipunang kamularan sa pamamagitan ng pagtatanghal ng iba’t ibang dula. Photography for Teens is a workshop for young adults, no younger than 13 years old, who love taking photos and want to take their skills to the next level.